Okay, I am not selling you, we approach people as friends. And we honor your vacation is a special time with family or other loved ones. The location and the view from this home are unreal. Been here 31 years and still get amazed at the Morro Bay Harbor and Embarcadero. No obstructions in your view of the Rock, the Bay and the Embarcadero. The picture of the Rock is through the living room window! You view the Rock, the Bay and the Embarcadero from your private fenced patio. Has a Weber BBQ. The lights at night softly reflect on the water, it's quiet, it's quaint and you are walking distance to the key part of the Morro Bay waterfront.. There's all kinds of restaurants, music, bay cruises, kayak rentals, all a half block away. Park in your designated space and you're done driving. This is for up to 6 Adults and two kids. One bedroom has a queen bed and a full size bed. The other bedroom has a full size bed. There is a sleeper sofa in the living room, brand new. There is one bathroom but it's roomy. Shower. The kitchen door opens out to the deck with a wonderful relaxing panoramic view. The decor is very tasteful, it's all new. With some cool funk. We provide towels, linens, a kitchen stocked with necessary utensils. To sum it up, this is an older California home that we have gone through top to bottom and restored it's character with contemporary and vintage furnishings. It's comfortable with a great vibe. How can it not when you're looking at all the beauty of the Morro Bay harbor. We honor our guests choose us to have a special time with their loved ones You'll love this home, and so will your family. I promise. No hype intended, but this location has not been available for 70 years, it was first taken then, there's no more like it. Thank yo for your consideration, please contact us if you have any questions. Charter Cable - lots of stations. 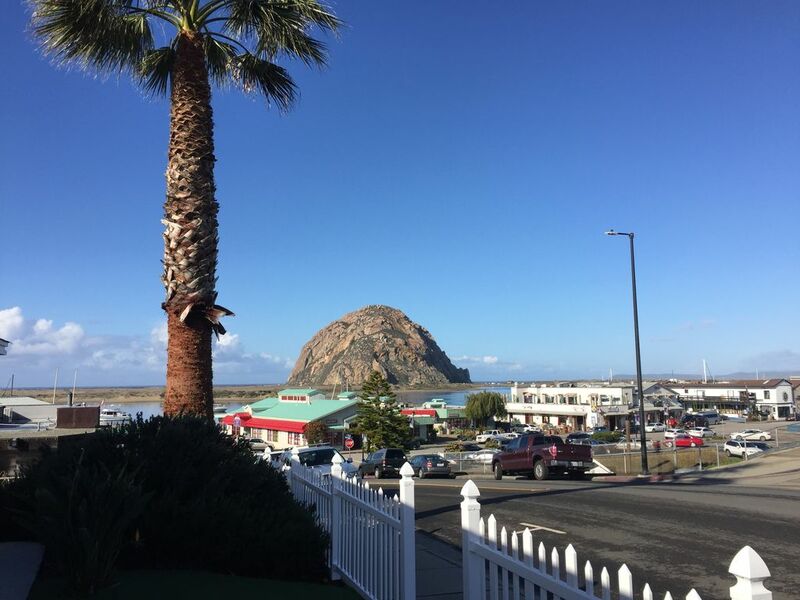 Access to all Morro Bay has to offer, wonderful state park and Natural History Museum activities, restaurants, shops, and boats within a block. The cottage is comfortable and clean, with all I needed for an extended stay. Enjoyed our stay in Morro Bay very much. Perfect location, great views and nice to have a small yard for the dog. Great location so many things to do within a short walk. Gary & Gary were great hosts with tips on what to do in the area. This property is a great location and very a clean property. It was the perfect size for us. The back patio was ideal for enjoying the evening views and some wine. There were a few things we would have liked but not necessary. For instance there wasnt an iron for us to use and the gated yard for the dog to do business was dirt. The road noise and weekend business on a Saturday night was a bit tough to sleep through when you have to wake at 4am, but it was quiet by 11pm. All in all we would definately stay here again. We were a group of four high school friends celebrating our 60th birthdays by traveling the Pacific Coast Highway from San Francisco to Los Angeles. We weren't familiar with Morro Bay, but it was the halfway point for us, and we couldn't have been happier with the location and Gary and Gary's vacation home. The house is well equipped and very clean. There are other units in the small complex, but the corner location of the unit provides privacy along with a fantastic view. A grocery store was less than a mile away. As mentioned in the other reviews, the location is within walking distance of the many shops and restaurants on the Embarcadero. (half a block away). Great seafood and service at every restaurant we tried. It's also a short walk to the ocean where we were able to watch the local surfers in action. We took day trips to nearby Pismo Beach (had lunch at a restaurant on the beach watching a surfing competition), San Luis Obispo and Avila Beach. I wouldn't hesitate to rent from Gary and Gary again. Loved their rental!